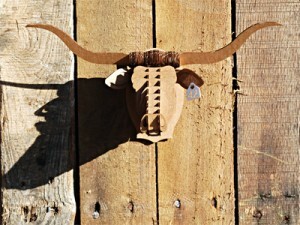 Yesterday, Dad and I assembled a tiny, mounted Longhorn steer head out of cardboard so that we could give it to our friend Julie for her restaurant. Our gift was the second cardboard mounted animal head (the first was a moose) to accompany the actual, taxidermied deer head that is in the back room of their local restaurant. The restaurant is one of my favorite places to hang out (despite the deer head), and I love seeing the little moose every time I go in. I have to admit I was a little disappointed. I had hoped to see “Austin” (as I had named the steer) hanging beside the moose and deer in the backroom, but Austin was a gift, and the nature of giving is that you can’t control how it’s used. Each day, I put out hundreds of words that I have carefully assembled in blog posts and commentary in various other forms of social media, and each time, I expect that people will use my words as I intended. Perhaps they will agree with me or disagree with an idea I’ve shared . . . maybe they’ll even get riled up over the things I get riled up over . . . Sometimes that happens; usually it does not. Most days, my words reach someone else, and they shape them and use them as they see fit, weaving them into their experiences, turning them to fit (and occasionally change) their perspectives. This is the danger – and greatness – of writing. That when I put these words on the page and share them, they are no longer mine. They take on energy and meaning I never intended or could have thought to intend. I can be selfish and think of them as my property, but really, they are not . . . I have to learn to just take joy is glimpsing them out there in the world. There’s a reason why Dillard says, “GIVE it all; GIVE it now,” not “LOAN it all; LOAN it now.” Once they are in the world, they don’t necessarily come back. As Julie told us about her son and the hope that they all shared that he and his wife would be in Texas, not in Korea, as I thought how much it might make a young couple with their first child on the way feel a little warmer on this big journey, I smiled and let my soul settle a bit . . . making space to relish the thought of Austin making a road trip to his home state. I think he’ll like that.